Am trying out how to ink my comic... I'm enjoying using all the black pens and pencils and inks in the house. And this is what they look like with some flat colour dropped in. Hmmm. I think I should work slightly bigger, just so I can get enough detail in for the more obscure panels. But not too much bigger, else I'll have to cover too much round with fiddly pencils! Also that bear is way too small. I must make a size chart and pin it up by the drawing board. The dog, of course, is Gus. 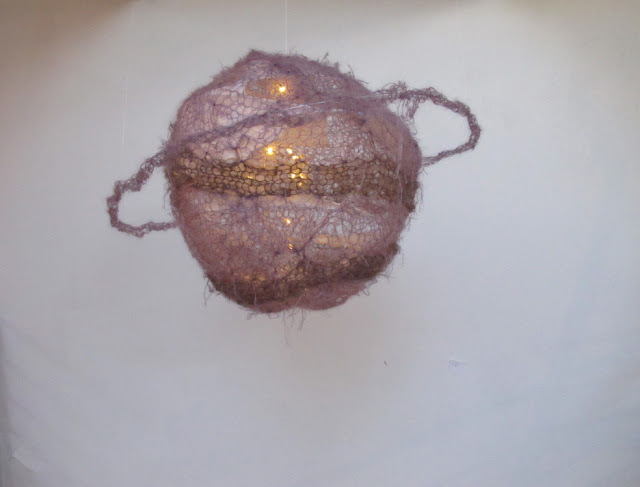 I didn't make this planet, I stole it from Frøydis' blog because I wish I could have seen her exhibition! I got a calligraphy pen from the bookshop, it's fun to use, although I haven't quite got the hang of it yet. 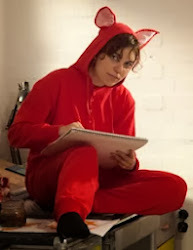 I think I might look through my drawers and find all my black pens and pencils and crayons today, I have a plan to try and draw something with as many things that leave black marks as I can get. I had a lazy morning watching Dr. Who, pinching out and sniffing the tomato plants, yawning... and really I thought I might take the day off but I'm bored now. 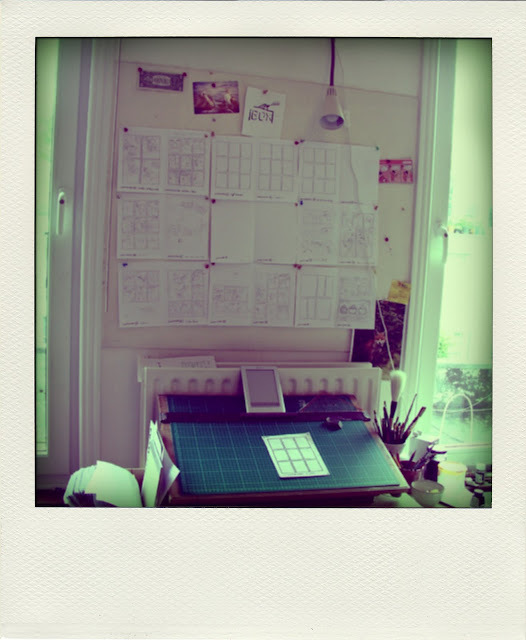 So instead I'll make a bean salad and then I'll transcribe all the changes I made in the graphic novel script while laying it out (quite a few, actually) so the editor can keep track of my scrawlings. 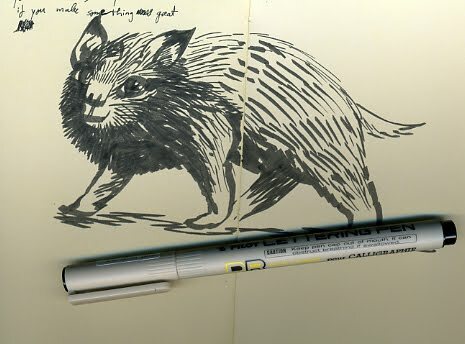 And then I'll try and draw something with lots of black pens. 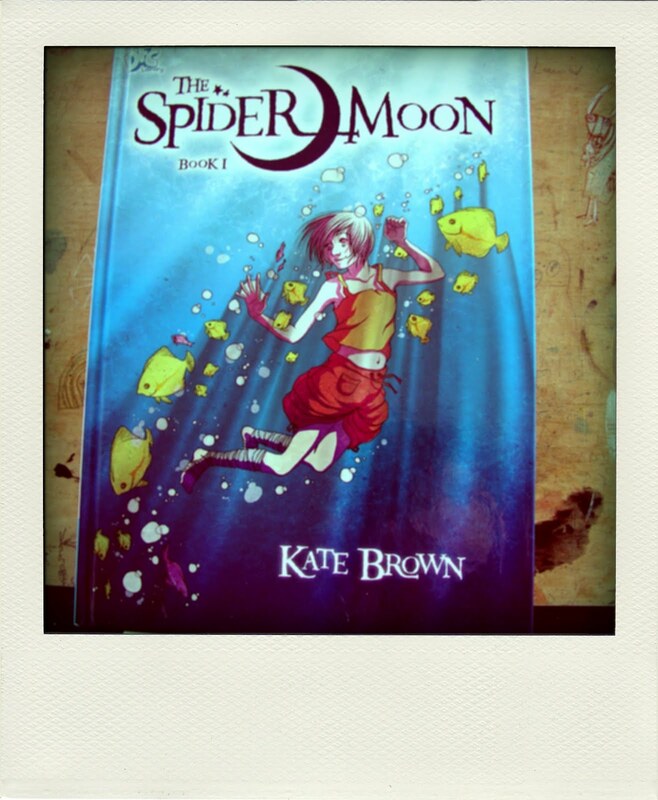 Here's another comic I bought recently: "The Spider Moon: Book 1" by Kate Brown. I like it very much indeed. 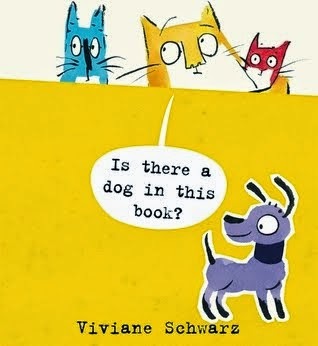 The main character is incredibly endearing - I'd have been imaginary friends with her as a child. She also has a great pet, lives in an adventurous world under threat, she has a serious job as a diver and she wears the best trousers ever. There's a map, and a how-to artwork extra at the end - nice! It's all been rendered with loads of loving attention to detail, well-observed expression, vast imagination - and it's beautifully coloured. I'm amazed and inspired. And I really want to read the other parts now. Am thinking about how to colour the comic. Bets to start thinking early, I figure. I'll draw it all in shades of black and grey, but it'll be digitally coloured in the end. 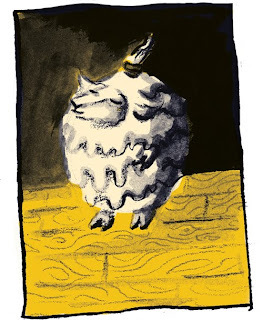 Am blobbing and scribbling loads of little drawings like this one, scanning them and fiddling with the colour balance... 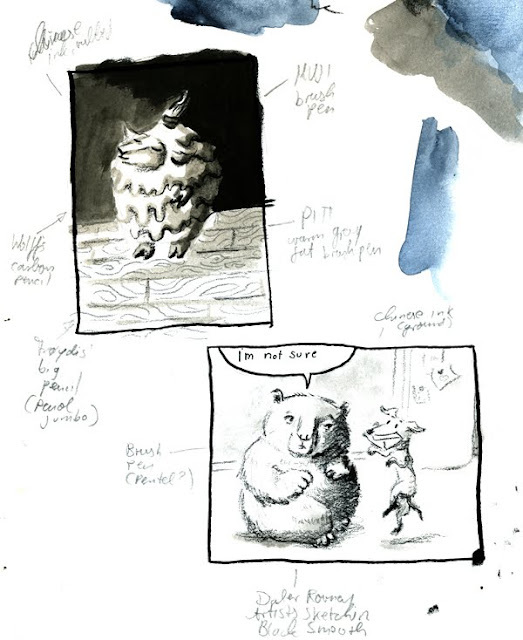 I might consult my process colour manual in some arcane way, seeing that I have months yet to decide on a colour scheme. 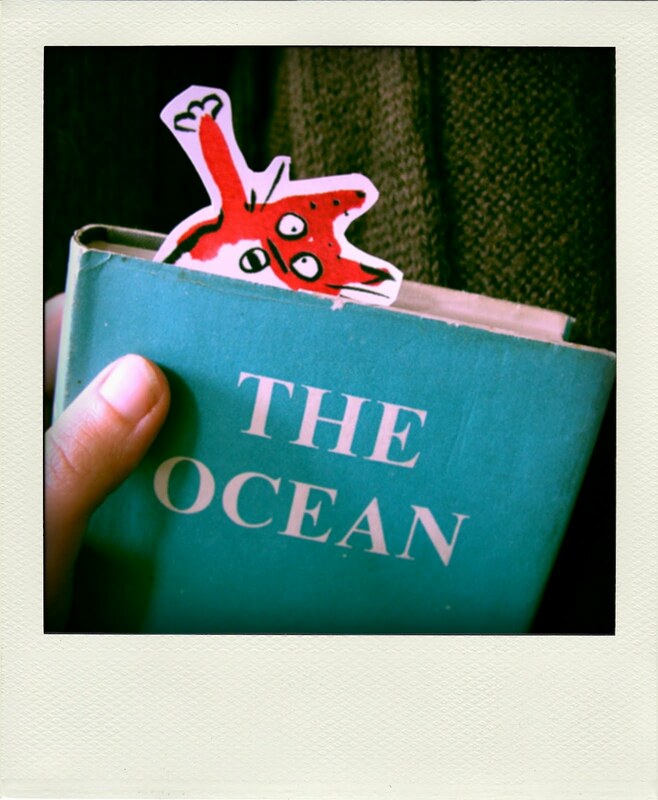 I bought that manual years ago when I had to work out what colour to make the text panels in "Shark and Lobster" to go with the illustrations and the mood... I got really confused, until the art director gave me a process colour manual and said "mark up the ones you want in there", and so I did. Not that I understood what I was doing, but it was very reassuring to have all those tiny squares of colour, and numbers, and to be assertive and go "THIS one" and writing it down even if you have no idea why. I still find it soothing to leaf through. Anyway, this scene there will quite definitely be mostly purple. 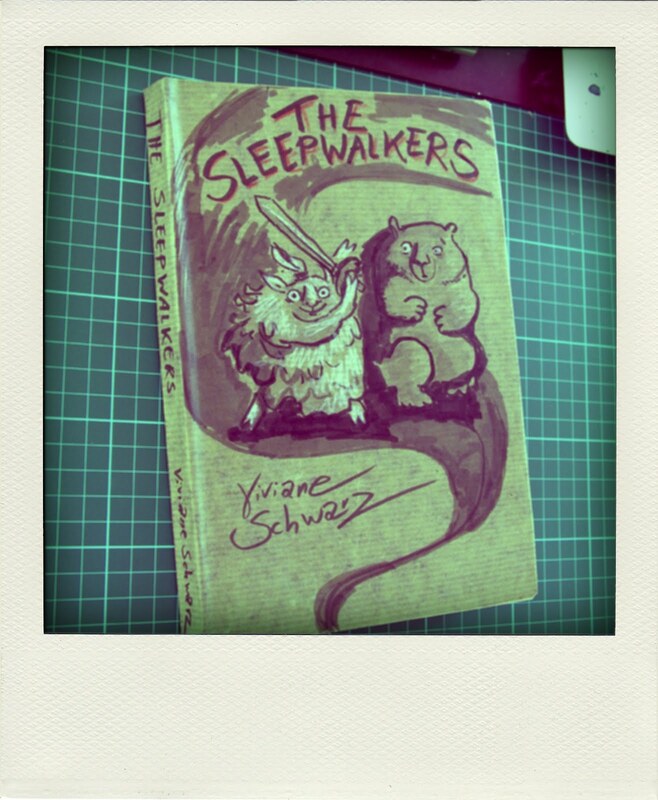 Bound them into a little book, just because it took me months to draw them, so I thought I'd better. 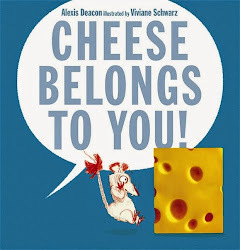 That cover is totally wrong, the Sheep is left-handed. I can never get that right. Ah well. 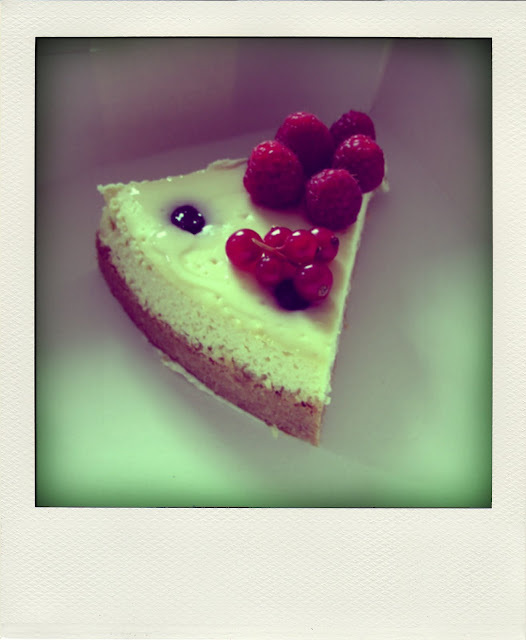 And because there's a pop-up cake-shop in my neighborhood every Sunday I can celebrate with cheesecake. That's there is the cheesecake I'm eating RIGHT NOW. HArrgh. This pinboard represents the last roughs I need to draw for my graphic novel, pages 72 to 89 that is. I am not drawing them in order, because I've found it's much easier to draw whatever scene I can imagine best at the time, and then fill in the gaps. I needed to work up courage with a second breakfast because as the story goes on it becomes more about the things that scare and upset me, and I keep checking if I'm being honest with it. For some reason I keep finding spare space in this last chapter. I was even able to extend a few quiet moments for better timing... that's one thing the book might be lacking, enough quiet moments... I wish I could take some of this spare space and squish it in earlier, instead I think I'll have to rewrite bits and bobs of the earlier chapters to give them a bit of breathing space. 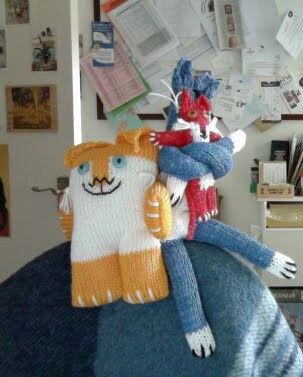 Celia Hart knitted Andre and Moonpie to keep Tiny company. Just look at them, so happy on the summit of Mount Blanket. Except, maybe, Moonpie, can't quite tell about Moonpie, might be emotionally preoccupied with keeping Tiny safe... but Moonpie always finds happiness in her own time. 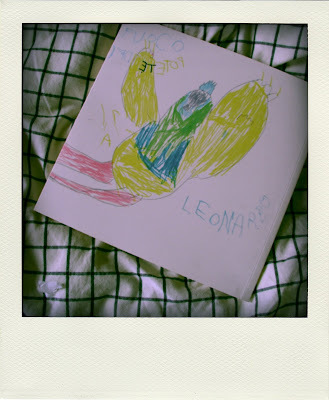 When I was a child, I loved books more than I do now. They were my keys to the real world, which seemed locked up in many ways. I never felt quite sure that when I read the same book again it would contain the same things - somehow they seemed to change. Of course it was me who was changing, learning new things every day, and whatever ideas the books suggested fitted into my changing world differently every time I read them. I still collect books that remind me of that feeling. That's what I'd like to do myself, with my own books: make you want to stop reading and go out and make a map, build a thing, discover something or make something up, be a detective or a cat... and that's what I'm thinking about every day when I'm walking around muttering to myself, how to charge up books with that little buzz of energy that zaps you into excitement about your own world. Recently I've bought more books than I used to, it's like I've caught the scent again. 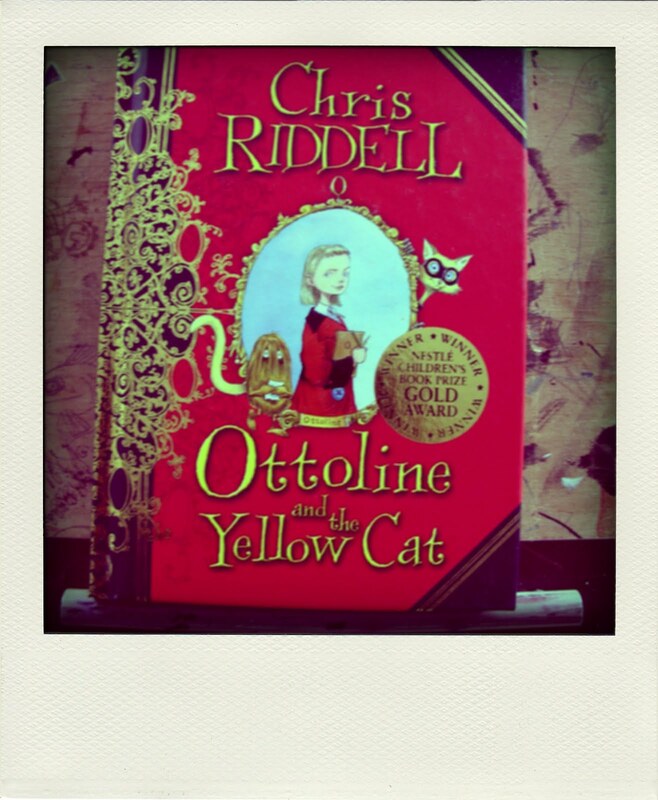 Chris Riddell's Ottoline books are mighty impressive, they are packed with maps and plans and plots and creatures and features. If you just flick through one it's almost like another reality whooshing by. 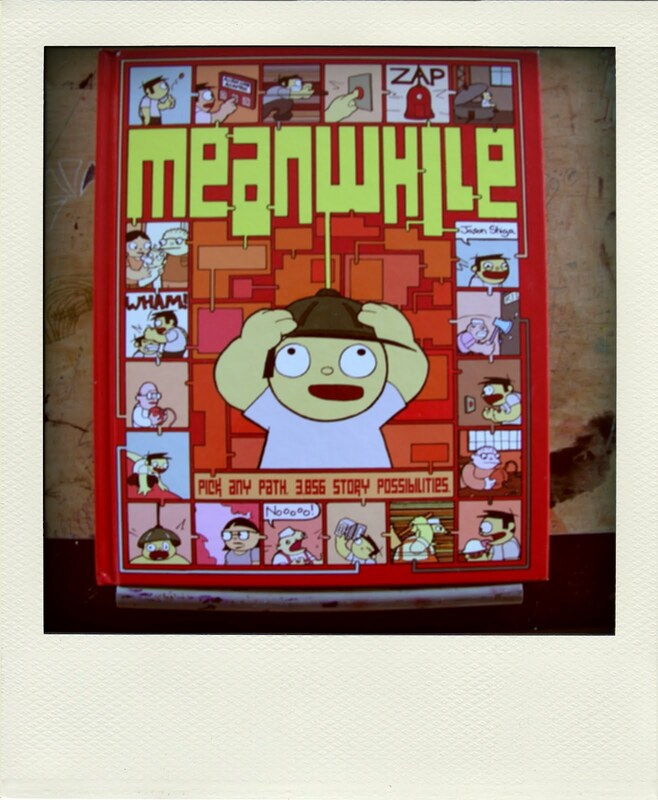 And this one is a masterpiece, rather: "Meanwhile" by Jason Shiga. And it actually IS different every time you read it. 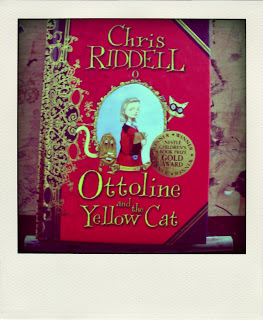 When I saw that in the bookshop, I thought: Ah!! Someone has finally made that book... it's a non-linear narrative that you read making choices and using tabs. I've tried to design one like that several times but never reached the required degree of complexity to make it worth-while... well, this is worth-while, and the flap text made me feel a lot better: apparently this guy needed to write a program to work out the layout and run it for 12 hours. I read it through once in the bookshop, going from feeling pleasantly entertained to worried to slightly upset and wanting to try again and make different choices... so I bought it, and read it five or six times more the same evening, every time feeling like now I'd read the story but also thinking: hmmm, maybe there is more to it, what if I try again... and I did, and discovered something new every time! 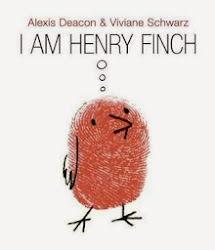 In the end I was quite sure I had read it all and wondered if now I had license to leaf through the whole book to see how it was made, and after having worked out the narrative this was like seeing a story in five dimensions. Amazing.... and the actual story staid with me as well, in a little emotional time-space-knot somewhere in my mind. I'll definitely need to get a new book-shelf soon... I think I've reached the point where I'm buying more new books than I give old ones away. Argh. I cycled to work! Didn't do any work, mind. Today I decided it's time to go on an easy cycling trip by myself, just up the nearest green route into Burgess Park, have a cup of tea and go back. Not go near any big roads yet. Just a lunch-time trip really. Then, in Burgess Park, I got a notion that I might explore just a little bit further west, and before I knew it I was at Kennington Park, very near to where my publisher is, so I thought: I'll go all the way there and that'll be a Useful Achievement. Which it was. And so easy! Then I had to go back, and I didn't have a map... I took a guess, and found myself quite suddenly in the Satanic Mill of Traffic grinding around the heart of Elephant and Castle. By the time it spat me back out I'd lost all ideas of avoiding big roads and such, or taking public transport (all completely crowded, and ladies with prams looking at me crossly). I turned down the offer of a nice old gentleman to take me home and cook me dinner, I said "here goes! ARGH," got on the bus lane with the other cyclists, and not knowing all the better routes home (there were several, I just checked, worst of all I went straight past Burgess Park again) ... I followed the bus, all the way along the biggest road there was. Now it's several hours later... how many? Not sure. I'm back home, and I'm not getting back on that thing without a map ever again. But I cycled to work and back!!! This is me trying out my webcam/netbook setup, to see if it serves as an emergency visualiser for events. It's a cat in one line. The webcam itself is ok, it's a HUE HD webcam I bought for half price off Amazon. Webcams have become higher res since this first came out - but this one is cheap, just-good-enough and has a swan neck. You'd still have to put it on a box or a stack of boxes to show anything larger than a postcard, and maybe have some sellotape handy to stabilise it, but that's ok. They have some free software to download on their site that actually also works with other webcams which helps to use it as a visualiser - makes it go full-screen and adjustable in some useful ways. Annoyingly, however, it seems the latest version of OSX Snow Leopard is a bit iffy with usb webcams, and so I can only make it work full-screen under Quicktime, and not with a good framerate neither. It works fine on my desktop mac which runs an older OS. Shall do some more tinkering later. I think it would work nicely with a microsoft netbook or laptop - haven't got one to test it on. So, not a very stable or easy solution on a mac, I'm afraid! But not a total failure at £25. Very much worth checking out, I'd say, if you are running Leopard or Windows. Or Linux, possibly. Other people have had nice results with higher spec webcams, particularly the Logitech Quickcam Pro 900, but you'd have to make some sort of structure to hold it above your workspace (I couldn't be bothered, also it's quite dear). I still refuse to spend £700 on a fully fledged portable visualiser, shall make do with this and wait until they've become a bit more sensibly priced! 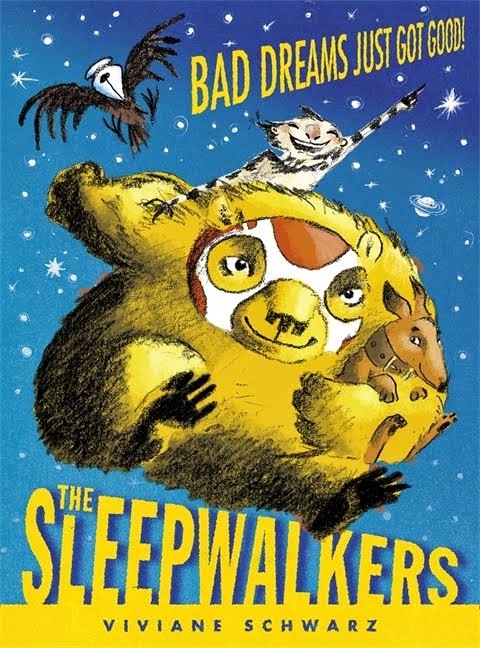 I went to Anthony Browne's book launch. Flatmate bought a first edition of "King Kong" and had it dedicated, I'm a bit envious. On the way there I noticed there are a lot more elephants in town than I'd realised (they are all for sale to benefit an elephant saving charity). 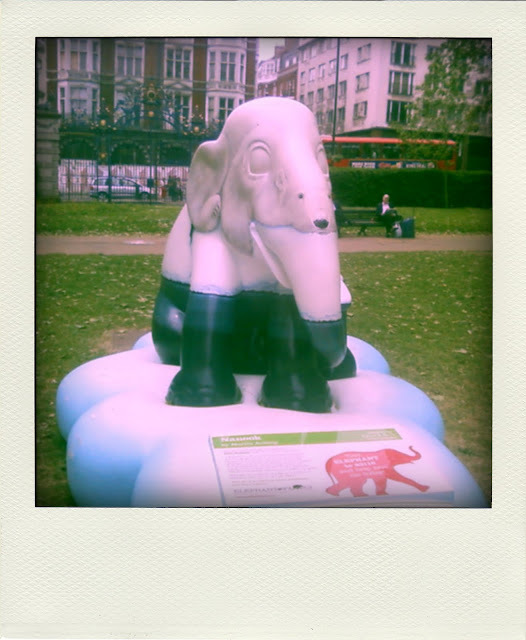 Here's one that's also a polar bear, by Martin Aveling. 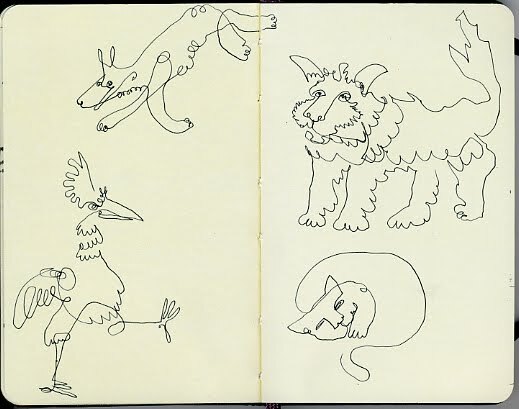 I had some time to sit around and drink coffee and work on a new song which keeps being rude, and I doodled some animals from one line each, which is a fun thing to do. 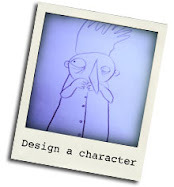 I was thinking of Daniel Clowes saying (in a talk I went to see some days ago) that he finds keeping sketchbooks a chore and a drain on creativity, so he doesn't do that any more. I know what he means there. I don't really have a sketchbook neither, I think of it as a scrapbook which is what my little books used to be back in school, although I gradually stopped collecting scraps in them. Mine have only notes in them, really, and warm-up-drawings which I need to do before I ink anything for real (although often I just draw a load of circles to warm up, when I can draw a neat circle I know I'm ready to draw for real). And very occassionally doodles like these. On the way back home we went to the Japan Center to buy some Sushi, and I got this cat shaped glass mug, and a tin of crushed pear juice to drink from it. Somehow or other I think I've hand-lettered all the books I've illustrated... it doesn't take me as long as it did at first. Lettering in a circle without smudging or getting confused foxed me for ages, but I worked out how to do it using a pin. Ugh. I still kind of have a cold. 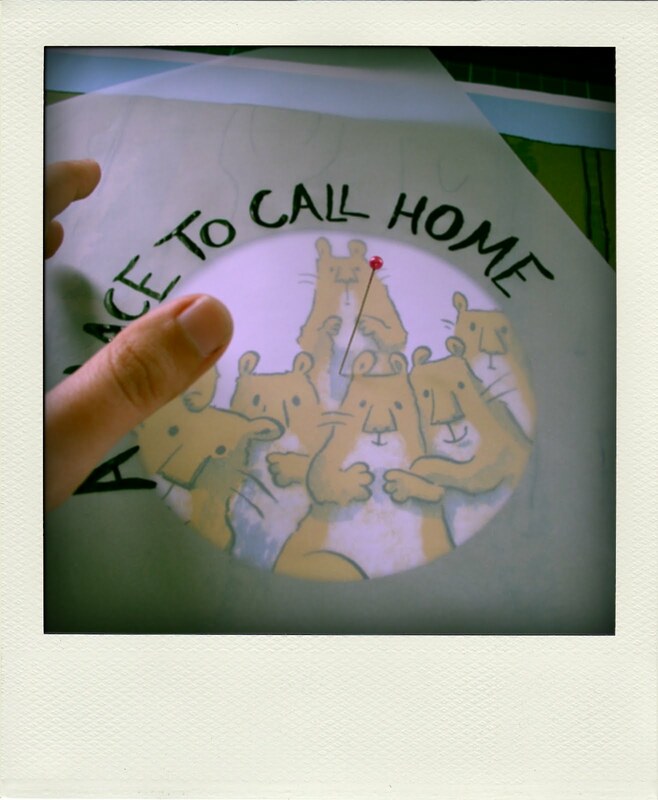 I need to draw the proper artwork for a picture book cover today and scan it myself, which means scanning it twice in opposite directions and merging the scans to get rid of the watercolour paper dapple, and also size it up a lot as much as possible because my scanner only fits A4. That's the fun part, I also need to hand-letter the cover type, which needs to fit around a circle, and it needs to be lettered with a brush and look reasonably neat, but not too neat. I am feeling very grateful to itunes Genius today for taking care of my work playlist, throwing songs at me that are cheery in a slightly wary way, bouncy but not too annoying. The Hay festival is suddenly very soon, and there's nothing more I can do prepare for my quick appearance I suppose - I'll be chatting and drawing and to some extent having breakfast with Grahame Baker-Smith and Anthony Browne in front of an audience (I think the audience gets coffee too) and then I'll run around the place to see what else is going on for a bit... 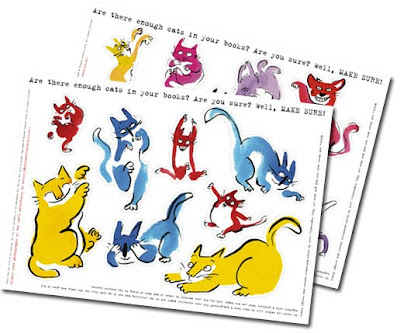 I'll make sure to take my coloured brush-pens so I can speed-draw a whole load of cats. I'm not sure they know what they're doing there, giving me a visualiser and a free supply of coffee at the same time, I hope I won't injure anyone. Ugh, I do feel a bit poorly. Oh Larks and there's a book-launch in the afternoon. Arrrgh. I am working very sensibly today. 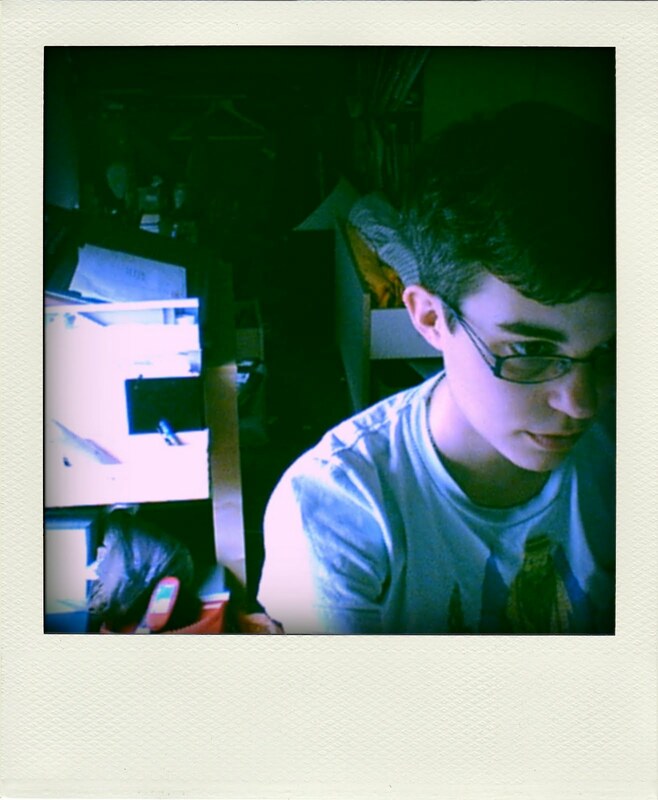 I got a sensible haircut and very sensibly drew seven hamsters on my sensibly set-up drawing board. Now I'm colouring them in a sensible shade of orange. Earlier today I had a disagreement with some ants about who gets to sit by the computer, turns out it's me. Which is the sensible choice. They can go back out on the balcony. 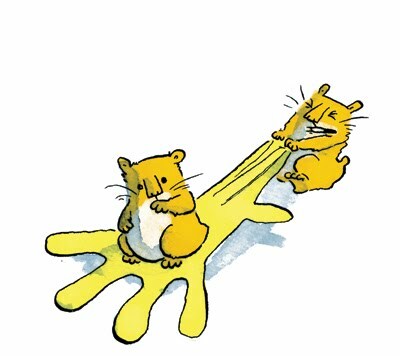 Here are two hamsters and a rubber glove. 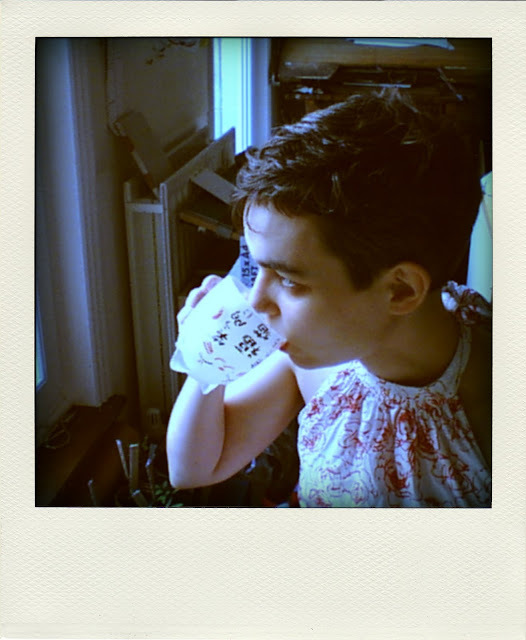 Lisa Hannigan, with papercuts by Maeve Clancy, via Sarah McIntyre's blog. That's like a good day at work! On my balcony. I just ate it. I have a cold, and am writing in bed while a black cat is watching me. I just noticed it sitting on the balcony wall, looking in with reflective eyes. It's a lot like the story I'm writing. If that cat poos in my salad tub I'll be very cross. When it's a bit less hot, I'll heat up some soup and eat it with Rye bread and sauerkraut dumplings and balcony lettuce. It's now so sunny that there's a salad harvest ready every day. Tomorrow I'm planning to get a very short summer haircut, and to go and see a talk by famous comic artists. I hope I'll feel better by then. I was supposed to go to visit my flatmate's gran for dinner, she made potato salad... but she's very old and I don't want her to get a cold, too. Gosh, how can it be this sunny when last week nights were freezing? That was last week, wasn't it? It may well be too odd, in which case maybe it should go into a collection of odd things. 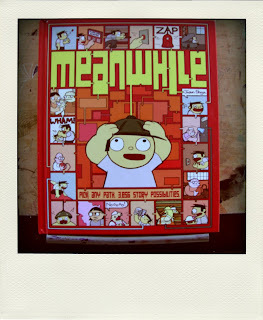 I think that would be a possibility, I've been meaning to try and make a book that's a collection of adventurous things, I figure that's a way of getting some stories published that aren't crisp enough to be picture books but still worth-while - fragments and ideas and oddities that linger in the mind, but that don't want to be a big board-bound 12-spread book to be enjoyed by a 4 year old in one session. A picture book (at least a British one) is a thing of strict discipline underneath the cuddly simplicity, and although I very much respect that it would be great fun to do something with some of the stuff that normally falls by the wayside. 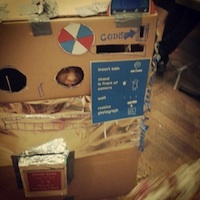 I just got back from the annual Write Away conference... hah, it was fun. It's the first time I participated in an event that was pretty much all fun. I think I'm getting used to them, slowly. Also I was introduced as a "genius" and that always helps, after that I thought: oh I can say anything I like now, that's the most outrageous thing said already. Heh. I got myself an accountant at last! Happiness!!! Now I have someone else to deal with my paperwork! And he had a look at my bookkeeping and pronounced it good. I have done well, but I need do no more henceforth. Well, none of the really complicated stuff, anyway. I felt so happy that I went and bought a pretty basket for my bicycle. Here it is. Beside my Moomin Shopper. 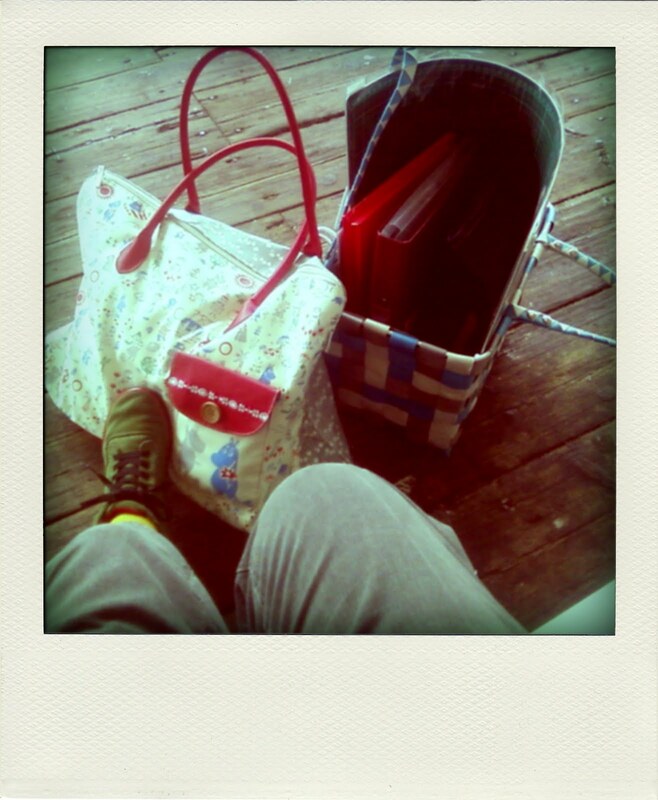 Full of stationery, including a spike for receipts, also bought while in the mood. I hear you can still get tickets for this week's Sad Lucy performance at the BAC! That's the show I wrote the lyrics for. Just to, you know, remind everyone. Also there's now an events calendar at the bottom of this blog. It's liable to disappear again, depending on whether it proves useful or just makes me feel silly. I just bought some awesomeness. 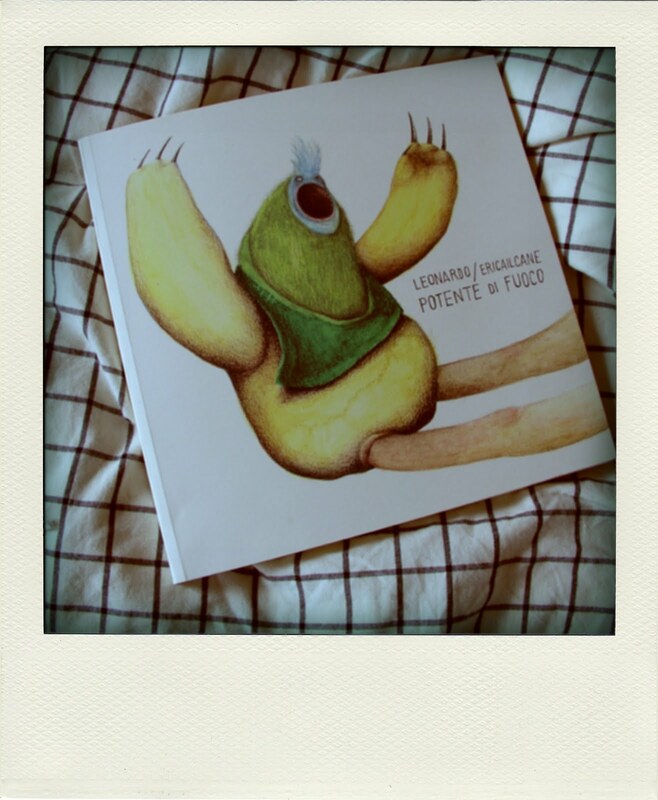 This is a collaborative book by ericailcane and himself twenty years ago. 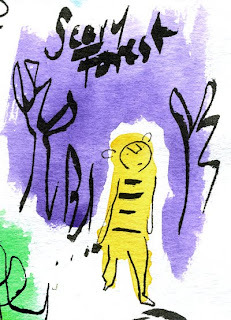 He re-drew his childhood drawings, thus creating a paper time-machine: "If I draw this and send it twenty years into the future, my older self will get it and make it look AWESOME!" What will you put into your time-machine? Or have you done it already? It's hard to tell sometimes! Here are some pictures from the inside... and you can buy it, too. I'm starting to feel a bit important... I can tell because I'm getting free books in the post! Mostly so I can prepare for talks I'm sharing with other people, and intelligently say "Bruce! 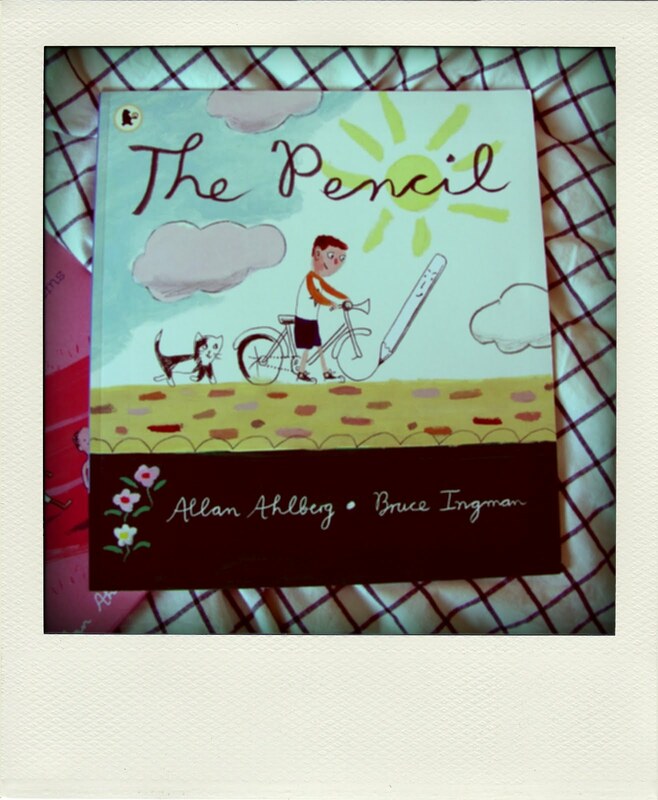 This book you made with Allan Ahlberg recently is a very good example of what we're talking about, especially the bit with the pencil!" I did really enjoy this book very much, it was the perfect book to read before breakfast, getting ready to face the universe yet again. It is all about the responsibilities of world creation, or: how to look after your art materials, especially rampant erasers. 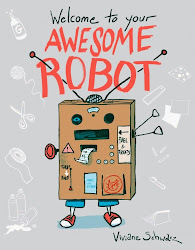 It's an encouraging book: it makes you want to make your own book straight away. And it's honest: it shows that creating things isn't just fun - it's also tiring and scary at times, and it's supposed to be that way. That's something you need to know to fully enjoy creativity, and ultimately very reassuring. 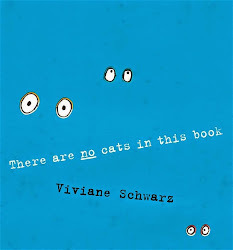 I would have kept this under my pillow when I was little. I finally got my own copy of Henry Moore's Sheep Sketchbook, after about a decade of borrowing it from the library every so often. 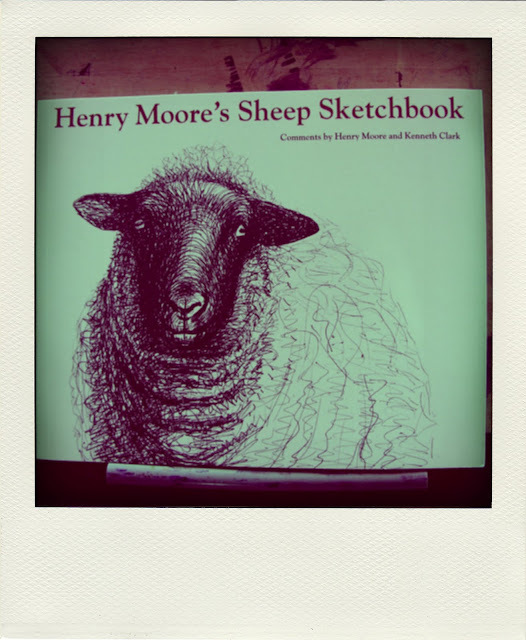 It's a facsimile edition of a sketchbook he filled with drawings of the sheep that were grazing around his studio. 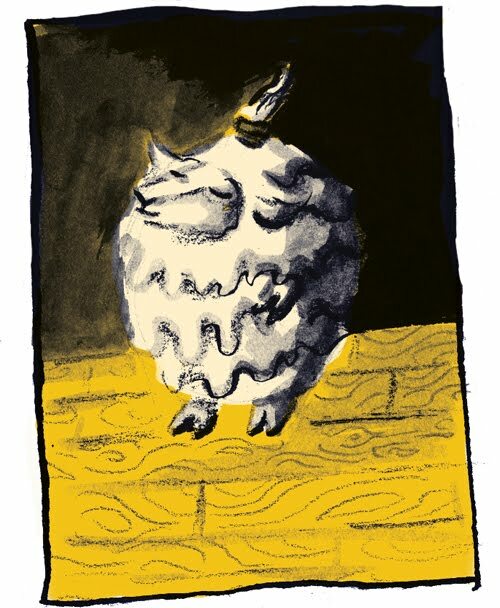 I've been looking at his drawings a lot, both at Tate Britain and in print, because I have a notion something about those drawings is extremely useful for the sheep-themed graphic novel I'll have to artwork very soon. 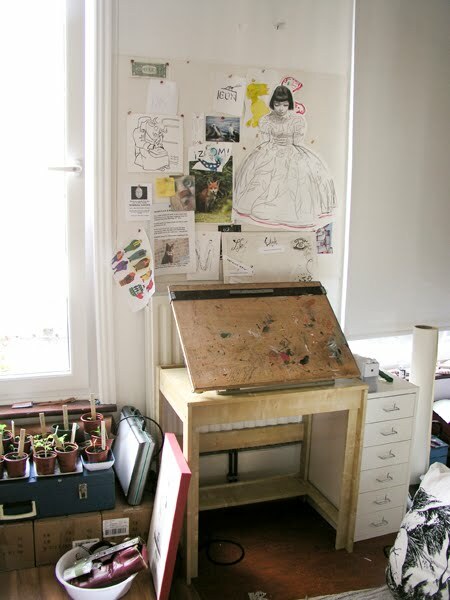 I also nailed a box to the side of my drawing desk because I needed somewhere to keep bits of paper.I almost smashed it to pieces in the process, but managed in the end. It really feels like a workstation now... but I'll have to get a new chair. I wish I could keep using my old one because I carefully sawed a hole for my tailbone out of years ago, but it's too low for drawing. 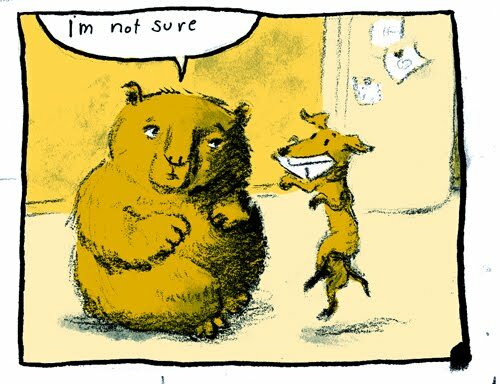 One question illustrators seem to get every question time is: what do you do when you run out of ideas? I always say I don't really, which is true. It's solutions that are the hard work, and asking the right questions - but ideas are always around. I went on my first bike ride in ten years and now I am reading. I'm glad I didn't get run over or anything. Bikes are awesome. Am feeling Personal Freedom. Alexia taught me a beginners lesson in using roundabouts, pretending to be cars with stupid drivers, going "RRRMMM" and "I signalled - but I changed my mind! What are going to do!" which was very good, and much better than trying it for real straight away. We had a break in the park cafe, and I enjoyed locking the bike up and watching it while eating soup. I made a correct choice on the way back on the real road, choosing between a car and a pothole in a narrow space. I chose the pothole. I think I'll get the hang of this. Also I think I deserve a short break now. 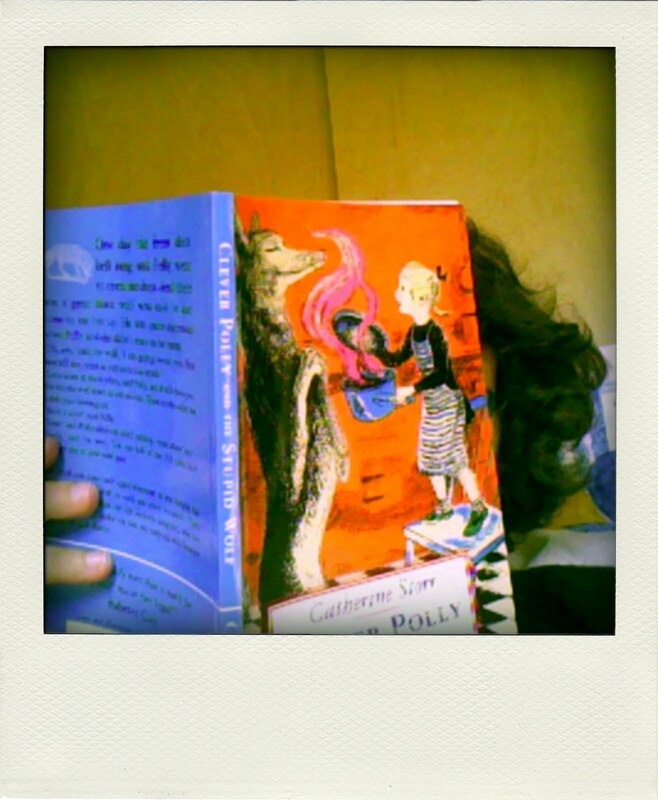 I think Catherine Storr is awesome, too. 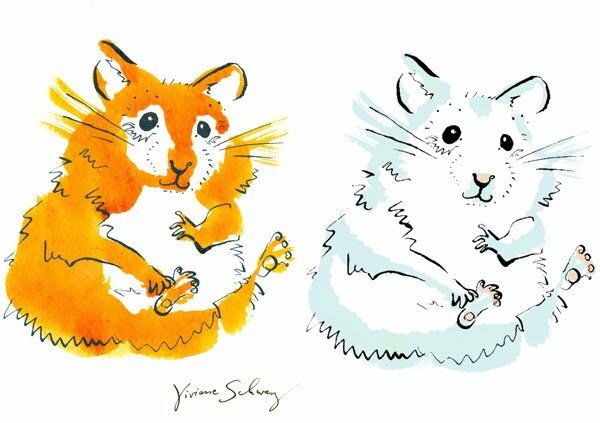 I digitally re-coloured a real watercolour drawing, experimentally, for someone who requested a picture of a white hamster that she could print on a t-shirt for her hamster-owning daughter. 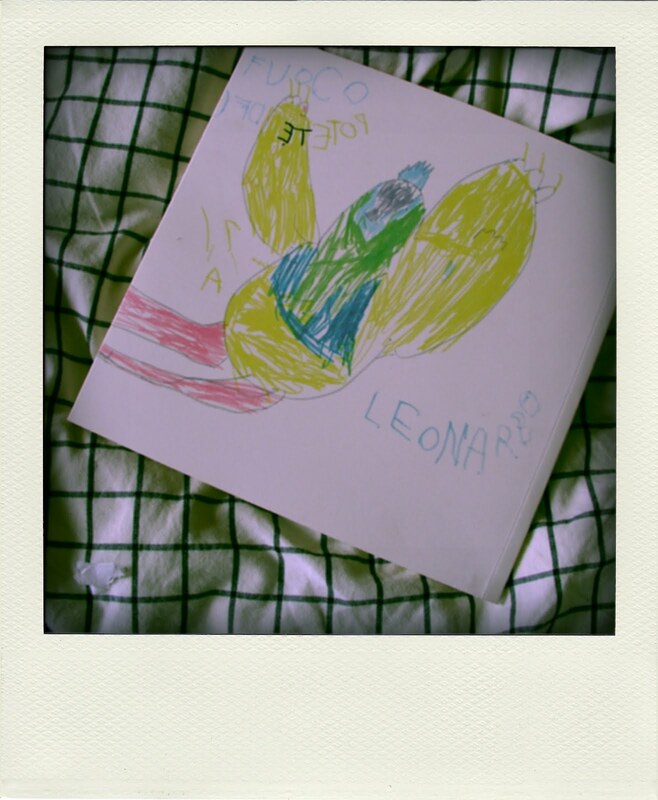 I had a scan of a golden hamster portrait to hand (the original drawing belongs to my nephew). Seemed like a good opportunity to try out my new computer desk setup. My room is much improved! My parents visited, and helped me get some desks. They also offered to take a few boxes of stuff to store them on their attic, which is very nice. Not this box though. 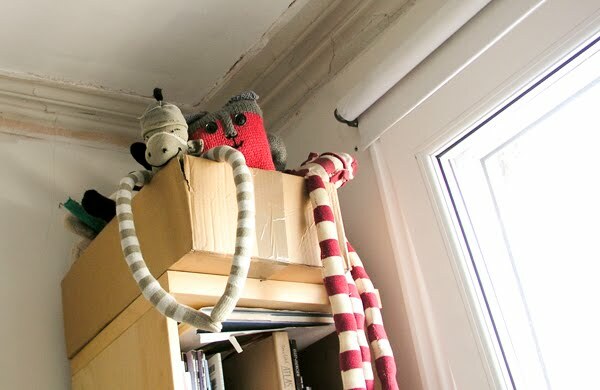 That's my important stuffed toys watching proceedings from a safe vantage point. 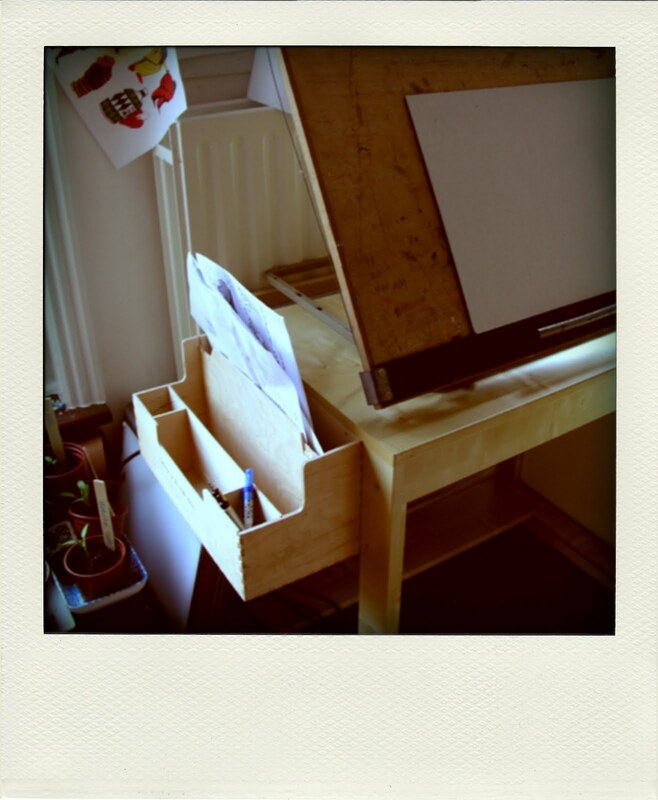 ...and a little drawing desk (check out my drawing board, that's been in storage for years! Here it is! The whole room is happier now. 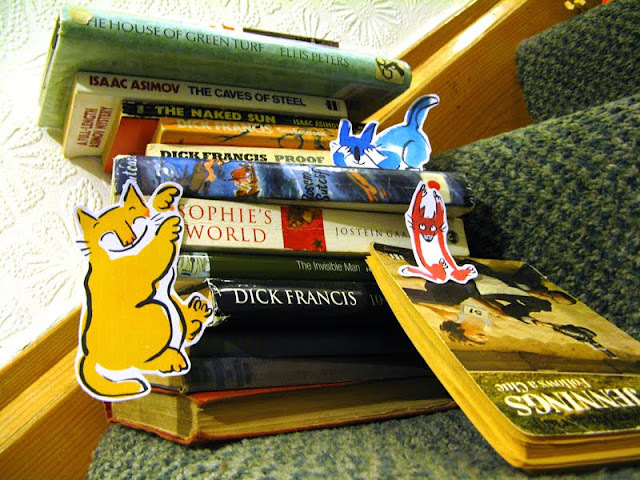 Here are André, Tiny and Moonpie desporting themselves on a pile of books which has been decorating the stairs for quite a number of weeks... They're having such fun it would be a shame to put the books away now. 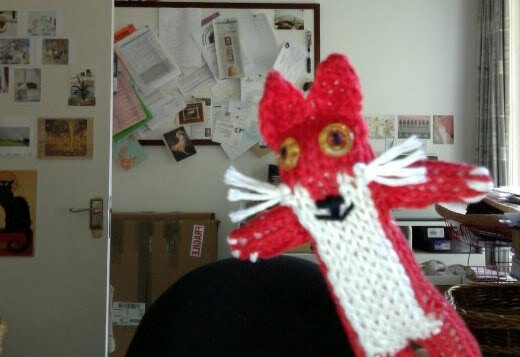 Celia Hart just knitted this lovely Tiny and sent me a picture. Yay! He looks like he's very excited about third dimension! 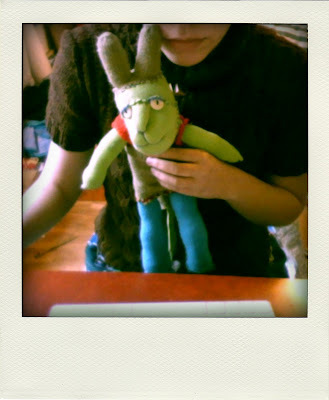 And from the look of her blog, he'll be living in a very nice place. Lucky cat. 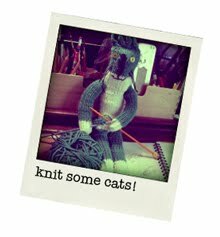 Knitting pattern is here, if you want to knit one too. I'm just tidying up my website a bit, and I want to put a "buy it here" link on my book pages - but I think Amazon is doing well enough, and I'd like to encourage people to go and use independent book shops. So I am using a yell link - not ideal. What I'd really like is a link to a site that will locate your nearest independent bookshops, if possible with the option to not list/only list specialist ones. Will someone please make one? I think authors etc. should have that alternative to Amazon when putting suggested sales links on their sites. UPDATE: A-HA! Localbookshops.co.uk! Thank you Celia! Have I mentioned that I want you to download some cats and let them have adventures, and most importantly send me photos of those so I can post them here? Desks. Why can I never have a good desk? 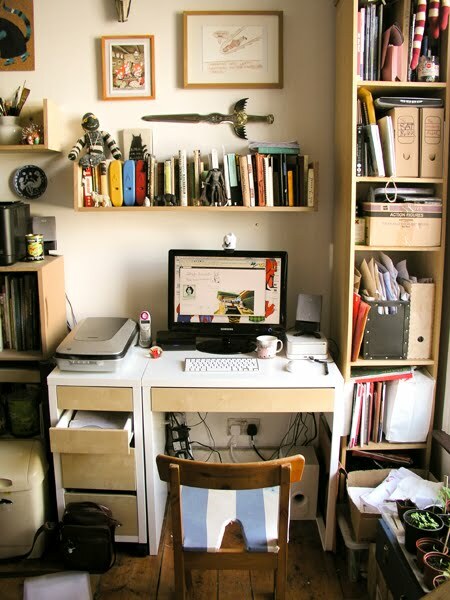 I've had a coffee table that I could only kneel at, I've had a desk hidden behind a huge birdcage, I've had a tiny desk with angular cohabiting boy's elbow always sticking over into my space knocking my ink bottles. I've worked sitting in bed with a drawing board across my knees, and at borrowed desks, and evil desks that collapsed onto my feet. 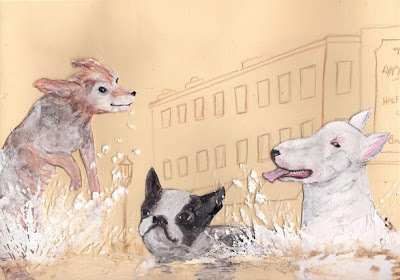 I've been friends with Alexia for a decade or so now, and I knew that she makes beautiful words and objects, but I wasn't aware that she also makes wonderful illustrations. When I saw these dogs I instantly set them as my screen background, and I keep wishing they were a spread in a whole picture book about dogs. There's just something incredibly lively and happy and good about them. 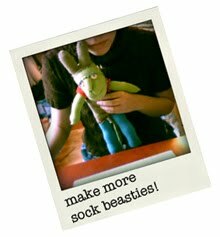 There's a brilliant video on enabling children to teach themselves amazing stuff over on BoingBoing. That's what I would want to do with my life, if I weren't making books. I'm actually still working on plans to develop short art workshops that would hopefully allow for and encourage this sort of thing as much as possible. It's hard to do in one hour sessions because trial and error is necessary but time consuming - I hope I can come up with ways to start something, get somewhere good by the end of the hour and then take the rest home and finish it there and people can send pictures of what it all turned into to an ongoing blog... anyway, this was wonderful to watch, and mentioned one of my favourite facts about the human brain (brainier animals too, actually): really working something out is one of the happiest experiences you can have, measurably. Frozen Banana. Testing for peelability every five minutes. 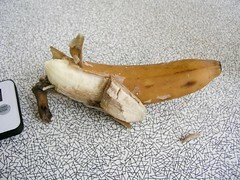 After fifteen Minutes: some peel comes off reluctantly. After twenty minutes: Peelable! Yet frozen inside. 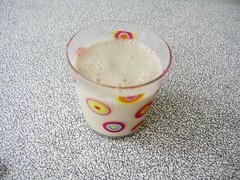 Broken into bits and blended with soy milk: tasty! And no need for freezer bags or tupperware. Quote flatmate: "You just watched a banana thaw for twenty minutes, how does that make you feel?" It's work, man! I asked Frøydis for an easy breakfast smoothie to put in my next book, this is vital research. By the way, go look at her blog if you want to see some Really Beautiful Breakfasts And Other Things That Are Good About The World. I just finished a sock bunny, it's a present for my mum. 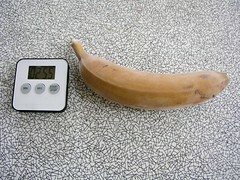 I'm also freezing a banana, experimentally, with the peel on, just to see how hard it is to peel a frozen banana. 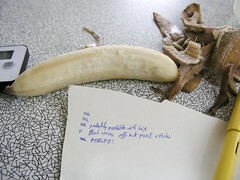 It's because I want to include a recipe in my next book involving a frozen banana, and I'm experimenting with how simple I can write it ("freeze a banana" would be simpler than "peel a banana and put it in a freezer bag and freeze it", both in words and pictures). I'll also try out some non-frozen banana recipes... bought a good bunch of them today, I predict a week of banana breakfasts. There you go! 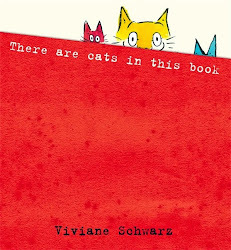 Now you can have cats absolutely everywhere. 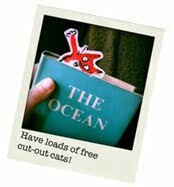 ... for your enjoyment, me answering questions about "There are Cats in this Book", filmed by CILIP. Hooray for Brighton! Otherwise: Ugh, I'm tired. I need a holiday or something. That's the second night I stayed mostly awake, after another day of the sort of work that tires me out anyway. Tailbone is sore from sitting at computer, shoulder is cricked. 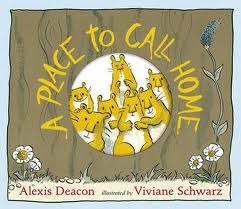 I wish I could hide in a beach house somewhere, just working on books for a month. I hope I won't get any emails today that ask me to do anything over the weekend, or at all, really. 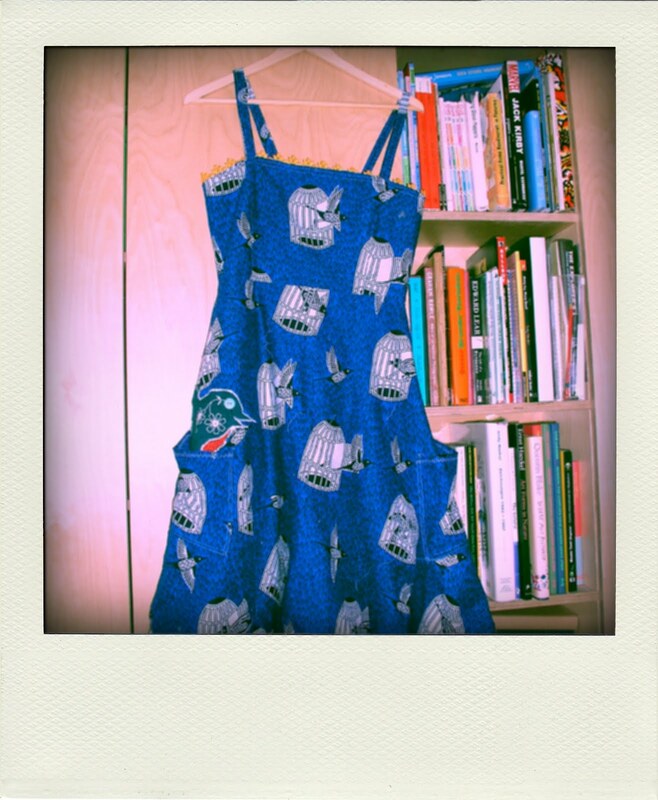 But: I did finish that dress. Came out looking only slightly odd. Yellow lace trim, silk lining and all. And big pockets. Might need a belt, still. I'm absolutely too tired, that's my state of the day, I just decided, too tired by maybe 4.5 miles or so to the left and at a slight incline, that's just an estimate because I'm too tired to actually calculate it.I woke up in the middle of the night with a cramp in my neck, a cramp in my leg and a notion of how to re-work the final chapter of my graphic novel. I let the scenes run like a movie a few times while un-cramping my leg, and finally when the birds started to sing outside I switched on my beside light and wrote it all down. 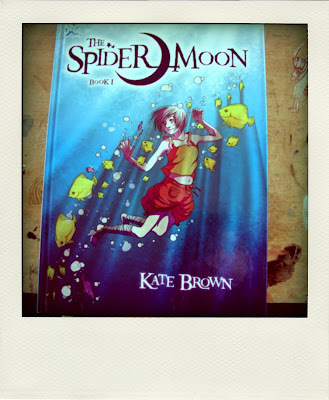 Then I fell asleep again, and no amount of black coffee has managed to wake me back up properly, even though I sleepwalked to the voting booth and back already, put together and mailed a slide show for Write Away and went to order Spider Moon at the bookshop. 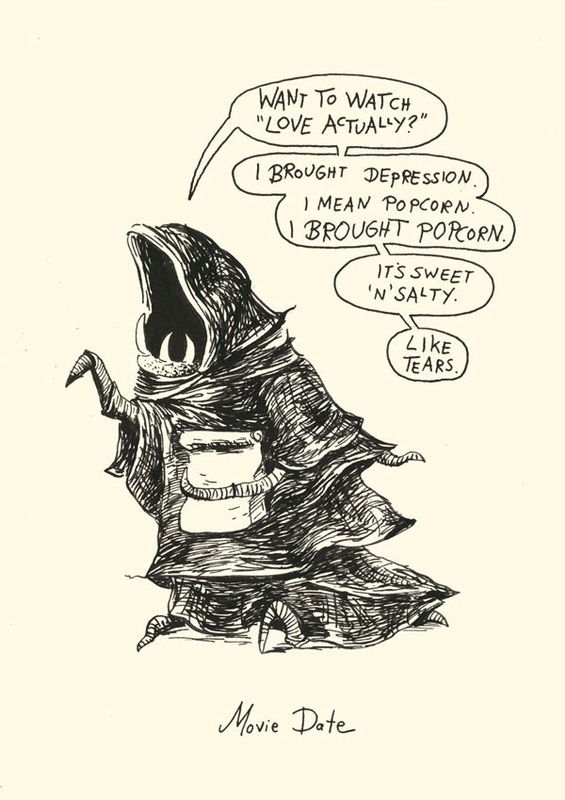 It's a melancholy weekend. Raining and raining. I'm drinking tea made from curly leaves, with a spoon of white kandis in lime green rum. Both the tea and the sugar in rum were presents, which is cheery. The tea cup as well, actually. I'm also making a new dress... this time one with pockets on the skirt. I'm making it from some fabric I bought on Rye Lane, and lining it with a yellow silk scarf, which was a present, too, some years ago. 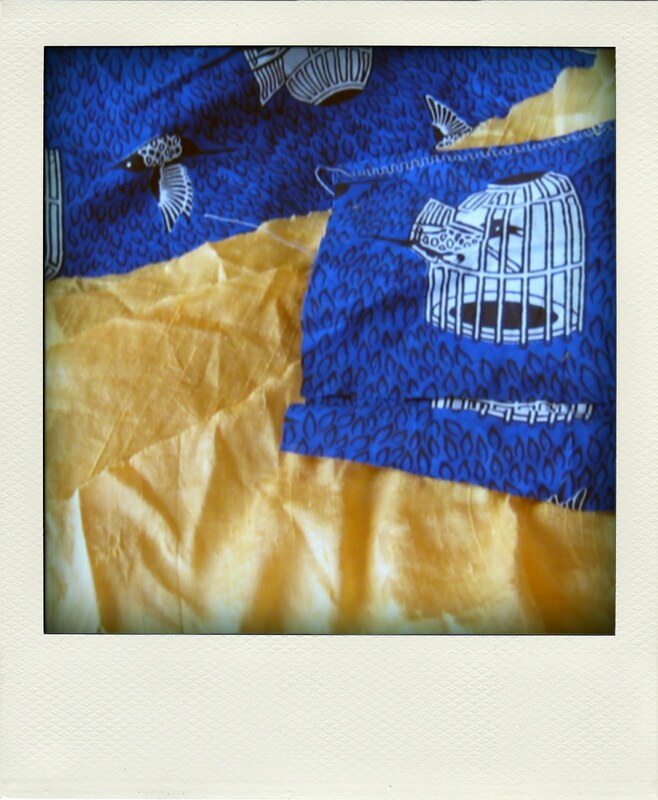 I think it's nice to re-purpose fabrics that way, every dress I've made for myself so far has been made from duvet covers, table runners, scarves and the like. I'll have to un-pick one side seam because I forgot to sew in the pocket already, otherwise it's still going all right... I've added a discreet extra bird that lives in the right hand pocket, made from a fabric sampler I got in the post last year. I put my graphic novel dummy under my pillow last night, just so I could stop thinking about it, like I used to do with text books before school exams. Is this worth reading? Does it explain or change something we care about? Is the emotion true? Do the characters actually interact while following their motivations? Like using an imagined set-square. If one of them is off, I re-work no matter what. I firmly believe none of them should ever go out of the window to make the other two fit. 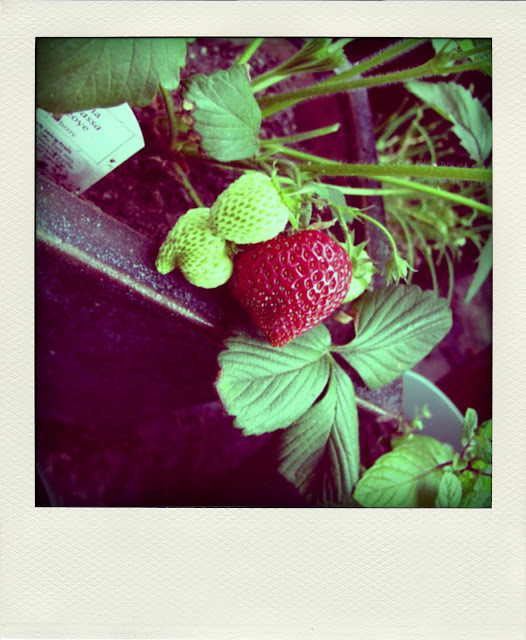 It's hard to see sometimes, though, and sometimes near impossible to construct. Hence long walks, posing of action figures, watching of movies, nerdy discussions, dressing up strangely, long intervals of thought with sudden distractions, and other attempts to attain mindfulness. Today, however, I'll have a pic-nic in Regent's Park instead.